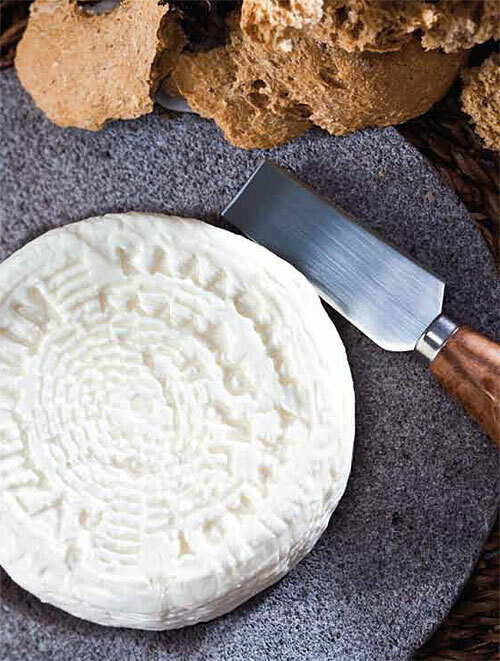 The production of cheeses with Protected Designation of Origin “KALATHAKI LIMNOU P.D.O.” and “FETA LIMNOU P.D.O.” started in 1986 in the island of Limnos. The products “KALATHAKI LIMNOU P.D.O.” and “FETA LIMNOU P.D.O.” are produced daily from Geek, fresh and pasteurised milk from the local producers of the island, which is collected during daily milking of their goats and sheep. Processing of approximately 4,700 tons of goat and sheep milk and production of around 1,300 tons of final product takes place in our factory located in the island of Limnos. Following cheese maturation, which takes place in special chambers in our factory in Limnos, the product is transferred to our central facilities located at Galatista of Chalkidiki, where it is repackaged so that to be placed on the market. It is marketed in a 400 gram plastic packaging in brine and in metal tinplate containers.